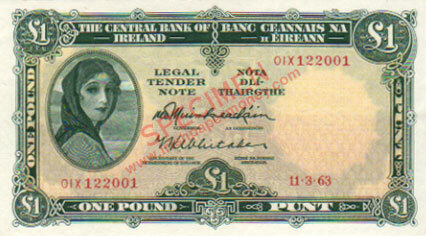 The Extraordinary Issue One Pound notes with prefixes 01X and 02X were issued in 1974, and caused a minor panic at the time (as reported then in Irish Numismatics, and other media) as the notes did not contain a metalic security thread (introduced in 1971), and people thought these notes were forgeries. The notes were a response to a shortage of £1 notes and had been printed in 1963 with non-standard prefixes, 01X and 02X. 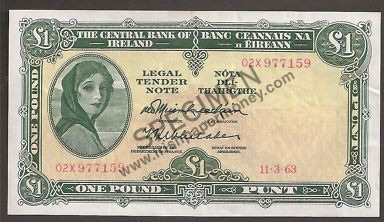 Central Bank of Ireland One Pound 1963 01X prefix. These notes also exist with dark ink date and serial numbers, the mulberry variety. Not a very good pic on this one, but it does illustrate the difference. 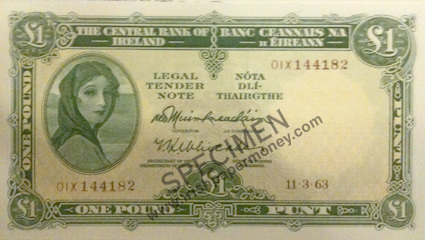 Central Bank of Ireland 1 Pound 11.3.63 01X prefix, Mulberry serial numbers. I've done a quick survey on these to track serial numbers to test if both prefixes were completed. Both prefixes go well into the 900000 region, so it is pretty certain that the full two million notes were printed for the date, and that they were all issued. I wouldn't mind having 01X 1000000, if it was printed. 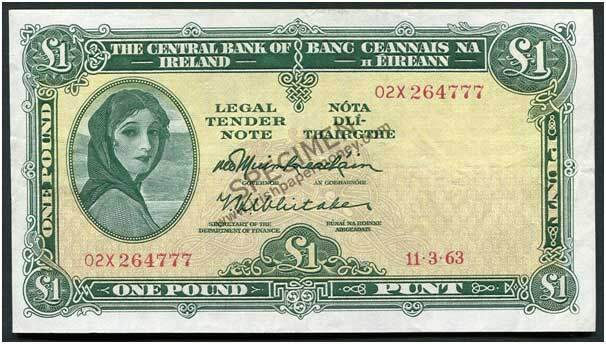 These were issued due to a Banking Strike taking place at that time. That's the background for this anomaly. Yes, but the anomaly is their existence in the first place. Were they printed to be used as replacements, perhaps? Latest update on the survey of the 11.3.63 01X and 02X notes. 01X 400000 — no notes recorded in this hundred thousand region. Reported, see below! 02X 200000 — no notes recorded in this hundred thousand region. Reported, see below! Highest note recorded is 02X 962538. 02X 977159. Lowest note recorded is 01X 056159. From these data, it is reasonable to conclude that all two million 01X and 02X notes were issued. That leaves just the 01X 400000 region. The survey of these notes is continuing. Added 12 new notes to the survey. Highest number has been pushed out to 02X 987752. There are 119 notes recorded in the survey thus far. I just spotted two examples of an 01X note in the 400000 region: numbers 01X 403657 and 01X 417396, pictured. The picture isn't great, but good enough for the number to be visible, which is all we need. This completes the observation of all the number ranges leading 0 to 9 for both prefixes. There are now 141 notes recorded in the survey by image. 153 notes recorded as of today. Three more notes added, brings the count to 156.